I have been commissioned to design the garden for an estate in Norfolk. Formerly a farmhouse, this has been a residential home for a few decades. The existing grounds where badly neglected prior to being taken on by the current owners and even after examining the site carefully it is apparent that the grounds and gardens were originally done piecemeal. With no overall design connecting the different areas together it is going to be quite a task to first create some cohesion between the features and gardens that are to be retained before beginning to design the individual garden areas. 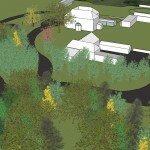 One of the biggest challenges so far has been creating an entrance road/driveway that will serve the property. At the moment the drive approaches the main house from the side and diminishes the impact of what is actually a very attractive frontage. I have, after many false starts, come up with a design which allows the owners a through drive which loops around whilst forcing visitors to approach the the house from the front, without having been able to see it on the approach. I believe this will create a much better first impression. Parking is provided to one side just to the front of the house, so the view from the front looking out is preserved free of vehicles, and visitors only see the house as they emerge from the parking area on foot. This system will also screen the true extent of the grounds allowing guests to be surprised, should they be shown around by the hosts.